_Our plumbers know all about conventional gas or electric water heaters as well as newer tankless (on- demand) water heaters. Don't stress over water heater repairs, Pieper’s Inc. will take plumbing problems off your back. You may purchase a water heater through us or pick up one from the supplier of your choice and hire Pieper’s Inc. to install it. A conventional water heater should last about 11 years, tankless heaters have a life expectancy of 15-20 years. Hard water will shorten the life, regular maintenance will prolong it. Tankless heaters are considered more energy efficient than conventional heaters because they don't have to continually heat a tank of water. Tankless heaters heat water instantly whenever a hot water tap is opened. But not all conventional heaters are created equally. The most heavily insulated models like the Marathon® brand rival tankless heaters for efficiency and require no special modifications to your power supply, gas lines or ventilation. 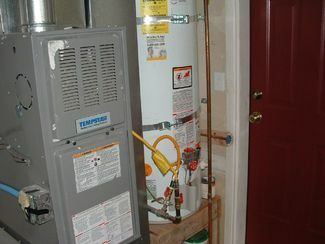 Is your water heater too hot? To reduce the risk of scalding and to avoid the risk of running out of hot water, we recommend a temperature setting of 120°-125° F.
Always keep safety in mind when it comes to water heaters. Never store paints, solvents or combustibles near the unit due to the obvious risk of fire. Find our featured Plumbing Contractors in Plumbing Sales, Plumbing Service featured as a York, Nebraska Business in York Marketplace.